While all eyes were riveted on the trials and executions of captured Hunters at Kingston in eastern Upper Canada, a new army of Hunters and Patriots prepared to attack the colony’s western border near Windsor. It turned out to be the final organized invasion of the Patriot War and a bungled bloody affair like all the raids before it. The man elected as top general of the Hunter army at the Cleveland convention in September, 1838, Lucius Verus Bierce, decided it was his turn to try and win the western front—after three spectacular failures by other commanders in the opening months of 1838. He gathered an army of Hunters and Patriots south of Detroit in late November of 1838. US General Hugh Brady—the man who had muted the Hunter armies before by confiscating their weapons—dealt the same blow to Bierce’s army. On November 24, Brady captured a ship carrying 250 weapons bound for the raiders. Because of their limited weaponry, Bierce hesitated to press on with the attack. However, a group of eager Patriots, led by self-appointed general William Putnam, refused to back down. In the predawn darkness of December 4, Bierce and Putnam and 135 raiders commandeered the steamboat Champlain at its moorings in Detroit. They sailed the short gap across the Detroit River and landed in the farmland south of colonial Windsor (then a village of about 300). 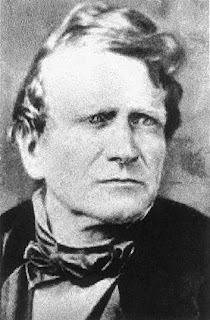 According to William Lyon Mackenzie, Bierce’s only role in the battle was to read a proclamation on the Canadian shore that stated: “Soldiers! The time has arrived that calls for action—the blood of our slaughtered countrymen cries aloud for revenge. The spirits of Lount, and Matthews, and Moreau, are yet unavenged. The murdered heroes of Prescott lie in an unhallowed grave in the land of tyranny. The manes of the ill-fated Caroline's crew can only be appeased by the blood of the murderers. Arouse, then, soldiers of Canada! Let us avenge their wrongs! Let us march to victory or death and ever, as we meet the tyrant foe, let our war cry be: ' Remember Prescott’." Bierce did more than Mackenzie stated--he did help in the initial attack--but was one of the first to retreat, thus saving his skin. After landing before dawn, the raiders marched quickly to Windsor and attacked the militia barracks. Deciding to burn it down, some raiders burst into the nearest house, owned by an escaped slave named William Milles, to get embers from the fire. They invited him to join their cause. He refused, proclaimed "God save the Queen, and was immediately shot dead. With the barracks aflame, the raiders shot militiamen as they fled, killing at least two. Two others died in the flames. (The remainder they captured and released after taking their weapons.) Next, the raiders set a small steamer on fire in the Windsor docks. A local surgeon and militia captain, Dr. John J. Hume, heard of the attack and rode into the fray. The raiders killed him and gave his sword to General Bierce. Two companies of Canadian militia followed the flames and encountered the raider army in an orchard on the edge of town at dawn. The well trained militia attacked from two sides and quickly contained the marauders. Twenty-seven died in the assault and retreat, including Putnam. The fleeing rebels returned to shore to find their steamer gone. The stole every small boat they could find and managed to get to safety in Detroit. By the time Colonel John Prince arrived from Sandwich with four companies, nothing remained of the battle but smoke and casualties. Upon hearing of Hume’s murder and the barracks assault, Prince began a ruthless campaign of summary justice, executing five prisoners. By the early afternoon, the militia, backed by a regiment of regulars, had secured the river from Windsor south many miles and captured more raiders. Prince, still in a bloodthirsty mood, ordered seven more shot in front of the burned-out barracks. This time, a group of Windsor citizens persuaded him to have mercy. At the end of the day, 46 prisoners where chained and sent on a journey to London, Ontario, to face the Queen’s justice. Search parties rounded up others over the next few days.